Captain Madeline Raster drained a step-back jumper with less than a second remaining to force overtime, but the Crimson could not hold on. 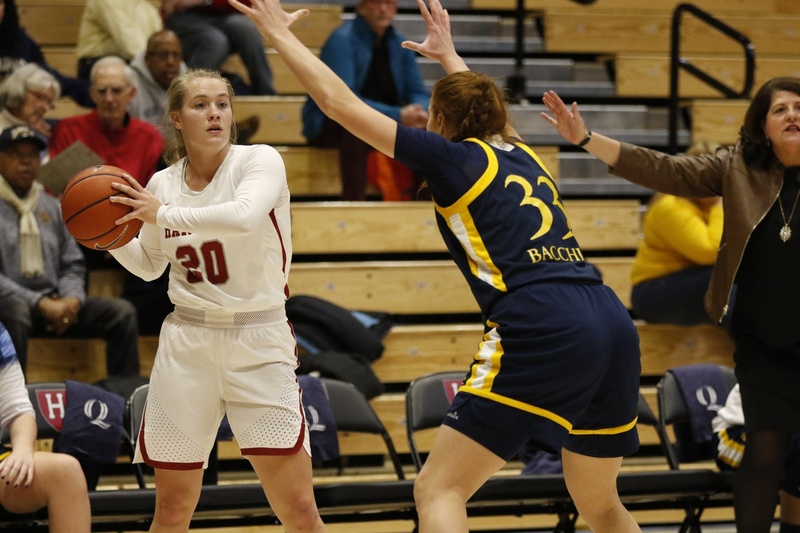 A late-regulation comeback and 27-point effort by junior guard Katie Benzan wasn’t quite enough for Harvard’s women’s basketball (4-4) Friday night at Lavietes Pavilion, who dropped 72-67 to Quinnipiac (4-3) in a double-overtime thriller to open its four-game homestand. Down 52-44 with seven minutes to play in regulation, senior guard Madeline Raster went on a late-game tear, including hitting a triple with three minutes left to bring the Crimson within striking distance at 57-54. A Quinnipiac layup put the Bobcats up 59-54, but Benzan quickly responded with a deep three with a minute left in regulation to keep the game at 59-57. A Harvard stop on defense gave the Crimson the ball back with 28 seconds to play, who fed the ball to their hot hand in Benzan. Benzan drove hard to the basket in the final seconds, but the ball sailed out of bounds off Quinnipiac with 1.1 seconds left. Needing a two to send the game to overtime, Benzan inbounded the ball to Raster, who nailed a buzzer-beating baseline jumper over a Bobcat defender to close out regulation. Harvard continued to carry that late-game momentum into overtime, racing out to a 64-59 lead with a minute left, including off a scrappy dive from sophomore forward Jadyn Bush to set up Benzan with a deep three. Benzan finished 7-12 from distance. “Jadyn just did a great hustle play, like we were talking about getting those 50-50 balls and she dove on the floor and kicked it out to me, and I shot it, and thankfully it went in,” Benzan said. The Bobcats weren’t done yet though, as they rallied back and finished the period with their own buzzer-beating heroics with a three to tie the game at 65 and send it to a second overtime. Harvard’s magical run didn’t quite make it into the second overtime, as it fell behind 72-67 to close out the game, giving the ball away on a few critical possessions. 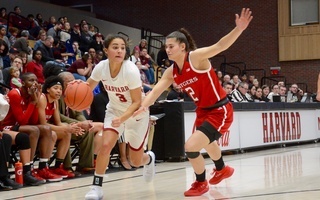 Turnovers proved costly on the night overall for the Crimson, who finished the game with 23 turnovers in spite of outboarding Quinnipiac 50-35 and finishing with a 42.9 field-goal percentage, compared to the Bobcats’ 35.6 percent. The finish may be difficult to digest for the team, but Harvard will move on towards its next contest, a home stint against Maine on Tuesday. 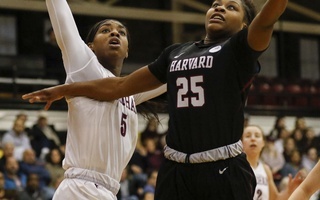 Despite an early 14-point deficit, Harvard women's basketball notched a come-from-behind victory over Siena. Sophomore guard Katie Benzan paced the team with 22 points.